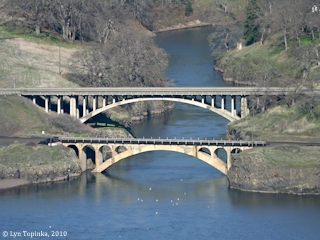 "North Bank Highway (Washington State Route 14), Washington"
Two bridges, locally known as the "Twin Bridges", cross the mouth of the Klickitat River at Lyle, Washington. The lower railroad bridge of the "North Bank Road" was built in 1908 and the upper Washington State Route 14 bridge was built in 1933. 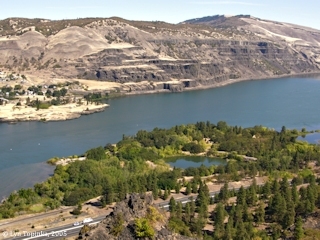 "North Columbia Highway", "Evergreen Highway", "State Route 8", "North Bank Highway", and the "Lewis and Clark Memorial Highway" are all names once used for today's Washington State Route 14 which follows the Columbia River, linking Vancouver (Columbia River Mile (RM) 106), with Plymouth (RM 290). Click image to enlarge Detail, 1909 Washington State Highways, Route 8. Original Map courtesy Washington State Secretary of State Archives, 2015. Completion of State Road Up Columbia Causes Rejoicing. "Vancouver, Wash., Sept. 28. -- (Special.) -- The completion and formal opening of the state road between Washougal and the section to the east and northeast of these will be celebrated in Washougal on Saturday, October 9. The citizens propose to make the occasion a red-letter day in the history of that town. Invitations to be present have been sent to the commercial clubs and citizens in Clark County and Portland. The state road, whose completion will thus be celebrated, begins in Washougal and extends in a northeasterly direction up the Washougal River to the Skamania County line. Thence it goes up Canyon Creek to Cape Horn, thence east to Goldendale, the present terminus, a distance of 110 miles." Source: "Morning Oregonian", September 29, 1909, courtesy Historic Oregon Newspapers Archives, University of Oregon Libraries, 2019. The "Lyle Convict Road", built in 1910-1911, was a part of Washington's State Road 8, a road which was to link Vancouver with Spokane. The most difficult section to build lay just east of Lyle at approximate Columbia River Mile (RM) 182, where large massive Columbia River basalts at the Rowena Gap had to be circumvented. This road was never completed. The Lyle Convict Road was located along the lowest bench above Washington State Highway 14. The convict camp was located on the flat grassy field left of the basalt outcroppings, east of the community of Lyle. "The North Bank Highway is a primary state highway 178.3 miles in length, 'Starting from the Pacific Highway at Vancouver, Washington, thence by the most feasible route and so far as practicable along and on State Road No.8, through Camas and Washougal in Clarke County, thence to Stevenson in Skamania County, Lyle, Maryhill and Goldendale in Klickitat County, thence northeasterly by the most feasible route to Mabton in Yakima County, thence to the most feasible connection with the Inland Empire Highway at or near Grandview in Yakima County.'" Source: James Allen, State Highway Commissioner, 1921, "State of Washington Eighth Biennial Report of the State Highway Commissioner for the Period October 1, 1918, to September 30, 1920", Olympia, Washington. North Bank Road Progresses Steadily. "Hard rock men and a steam shovel crew are making steady progress on the North Bank Highway between the recently constructed steel bridge over the White Salmon river, which divides Skamania and Klickitat counties, and teh Washington landing of the Hood River-White Salmon ferry system. The link of the road proceeds at the foot of the Columbia canyon paralleling the S.P.&S. railway line. The construction work is difficult, corresponding to much of the Columbia River Highway in this county. Blasts fired by the road crews in removing rock points remind oldtime residents of the heavy cannonading characterizing construction the North Bank rail line." Source: "The Hood River glacier", June 23, 1921, courtesy Historic Oregon Newspapers Archives, University of Oregon Libraries, 2019. "Nobody," unless they live in Underwood, can realize what the new highway along the North Bank is going to mean to the community which has for many years, nestled under the hills at the mouth of the White Salmon River." Many Hood River people have traveled over the old Evergreen Highway in good weather, on their way to one or other of the resorts in Skamania or Klickitat counties. Nobody ever traveled over this old road in bad weather, because there were too many thrills to suit even the most ambitious. The result was that Underwood, often for many weeks at a time, has been completely cut off as far as road travel was concerned. With the completion of the new water level highway sometime this year, Underwood will at times have easy access to the outside world, and, in addition it will get very much of the travel that in the past has either passed the community up or has gone over the Columbia River highway by way of the ferry at the White Salmon landing. During the past year a number of improvements have borne witness to the spirit of optimism which now prevails in the Underwood community. In addition to new warehouses and an improved depot, a number of changes are being made at the big store of the Underwood Mercantile Co., in anticipation of the good times which are near at hand. Improvement of travel conditions, too, will mean that many of the Underwood people, including those living on the heights, will more frequently visit Hood River, the road between Underwood and the orchards section above having been widened out and graveled until now it now ranks as a first class highway. As Mr. Smith says, the future of Underwood now looks very bright, which proves the value of a water grade highway. Source: "Hood River News", Hood River, Oregon., January 5, 1923, courtesy "rootsweb.com" website (2011).